We're coming up on the final game ever to be played in the current Orrville High School gym. On Friday February 22nd against Lexington, the curtain will open and close one final time on a gym that's seen so many greats since the gym was first used in 1955, when Bobby Knight was a sophomore. For the past several years, it's been Bob Knight Gymnasium...not sure if it had an official name prior to that (maybe just OHS Gymnasium), but what I am sure of is that it's been the scene of so many memorable moments, memorable teams and competitors and certainly some memorable coaches. Before the start of the boys varsity game with Lexington on the 22nd, a brief tribute to the gym will be held...current and former coaches and players of the teams who played in the gym (volleyball, wrestling and boys & girls basketball) will be honored as representatives of the sport they played in the gym. The point of this post is to gather some of your memories of our hallowed gym. Can be as a fan, parent, grandparent, player, coach, pep band member, student, referee or whatever relationship you had with the gym. 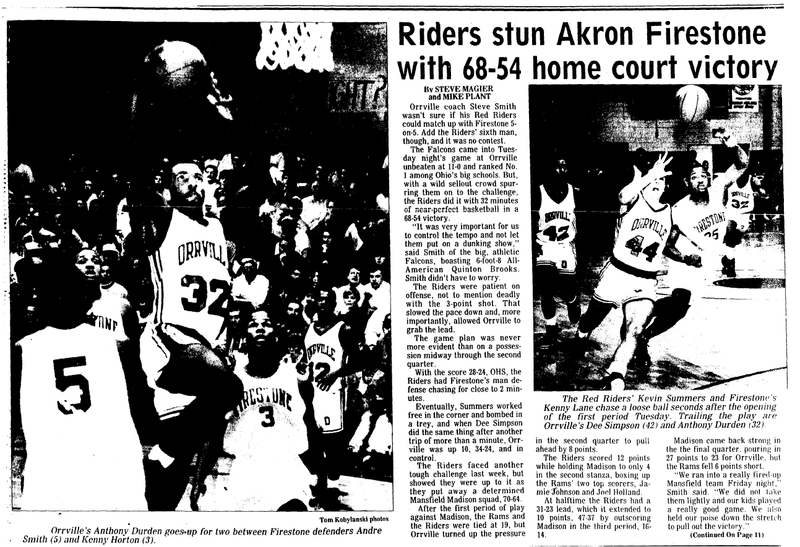 I'll start...and for me, it's one memory only that rises above the rest...the boys basketball game against Akron Firestone in February of 1992. Firestone came into the game with an 11-0 record, #1 ranked in Division 1 and boasting the trio of All-American Quentin Brooks, Andre Smith (son of Cleveland Cavs legend Bingo Smith) and Kenny Lane. They were as big and athletic of a team that I've ever seen....and in the typical fashion of a Steve Smith coached team, the Riders simply took the fight to them, defeating the Falcons 68-54. Here's the newspaper clipping from that game...it didn't give much detail about the game...guessing the game was up against a newspaper deadline for the Courier so all they had room for was the basics. It was one the most highly anticipated games in school history and tickets were sold out long before the day of the game. An overflow crowd watched via closed circuit TV in the auditorium. I was lucky enough to get a seat in the gym and if you have a copy of the game on tape...I'm the kid (a freshman at the time) standing up and blocking the view of the camera...so I have video evidence that I was in the building that night. Mr. Coppa wasn't too happy with me, but I wasn't going to sit on my hands all night. I've never heard a "buzz" in the gym louder than that night, and never has a crowd of barely 1,000 been so loud. Everyone knew who was coming to "our" gym..a big D-1 school with an All-American..and we wanted to prove that we not only belonged but that we were better. No offense to the crowds of today...but crowds back then were loud...I know it's hard to believe, but even the adults in the reserved seats were standing and cheering...we didn't wait until the 4th quarter to make noise, the cheering started before the opening tip. We stood and cheered as Orrville players were introduced even. Hard to believe isn't it? Firestone ended the regular season ranked #4 in Division 1 and advanced to the state final four while Orrville finished the year #2 in Division 3 in the AP poll, but won 8 straight tourney games to win the school's first team state championship. I'm sure this game would be #1 on a lot people's list..but there have been plenty of other highlights as well. Those years in the early to mid 1990's were so amazing from a memories standpoint. 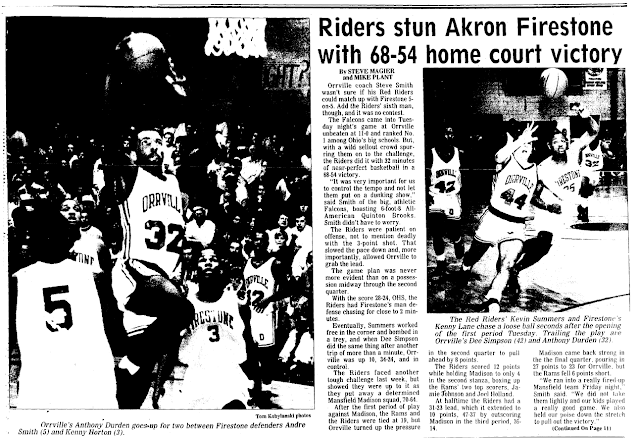 From the 1991-92 season through the 1995-96 season Orrville boys basketball won 115 games (average of 23 wins per season), 3 state titles, an AP poll title in 1996 and had an amazing 29-2 record in the post-season in those 5 seasons. It doesn't have to be games either...some of the "welcome home" celebrations from our 3 state championship teams were memorable as well. Our girls teams have clinched OCC titles on that court, and we've seen some great wrestlers compete in that gym...guys like Shane Hartzler and the late Jack Leeder. And even some sad memories as well, most notably Coach Smith's memorial service that was held in the gym in 2005...a gym where he helped make so many good memories was the gym where the town said goodbye. Not looking for anything specific, just your memories of the gym....could be memories of games or practices, players, coaches or fans. Just leave a comment below...anonymously or leave your name. Hopefully you can make it to the game on the 22nd...one last time to sit in those cramped bleachers and remember the glory years, the three state title teams, the 1980 and 2009 teams that went to the final four, the countless great teams that made us so proud season after season. The gym where coaches taught and kids learned...how to win, how to lose..and most importantly, how to be Red Riders. Tim, thanks for bringing back such a great memory. I had the best seat in the house that night; I rode the bench the entire game. But, it was one of those life memories that I am so thankful to have been a part of. Anthony Durden played like a Man that night - best game I ever saw him play. And Sly was the ultimate game manager. The energy in the gym that night was simply amazing. Thanks for posting the pic from that game. It brought me right back to such a great memory. I would have to say, my favorite "Gym Memory" was when me and my cousin Todd Snyder snuck in to the gym one Saturday morning. The wrestling mats were left out on the side, and we rolled them under the basket and dunked over and over. It is a great memory of my cousin Todd, and my favorite gym. Thanks for all you do for us out-of-town Red Rider fans. I'm sure there are many memories from alot of people in the 50's, 60's and 70's too, on both the girls and boys side of basketball. I for one had the pleasure of playing girls basketball in the 70's. People seem to forget that basketball was in full swing back in this time period. We played in the Bi-County League and played for championships too. Woman's basketball changed from 6-man to 5-man in 1971. I think we were the only Orrville family to have 3 girls from the same family in the starting line-up during the 1970 and 1972 seasons. My sisters - Nancee '70, Jan '72, and Pat '75 were all part of the program too. Three of the four were also senior captains of their team. I cherish the memories of playing with my sisters along with all of our teammates. I also think I was the first 4-year Varsity girls basketball letter winner in Orrville too. How proud Maude and Irv must have been of their daughters. Let's remember the girls basketball teams of the late 80s and 90s. 1993 trip to Columbus for the Lady Riders.